An historic season is in the books for the Northwestern Wildcats. The third 10 win season in school history, the first bowl win since 1949 and Coach Fitz moved into sole ownership of the title of winningest head coach in Northwestern history. This combo was the most worn combination all season. Of the combinations worn more than once, this one had the most stout defense and was second in points for per game. What is truly amazing, though, is the disparity in points for and against, especially considering that the Vanderbilt and Illinois wins were not in this combination. 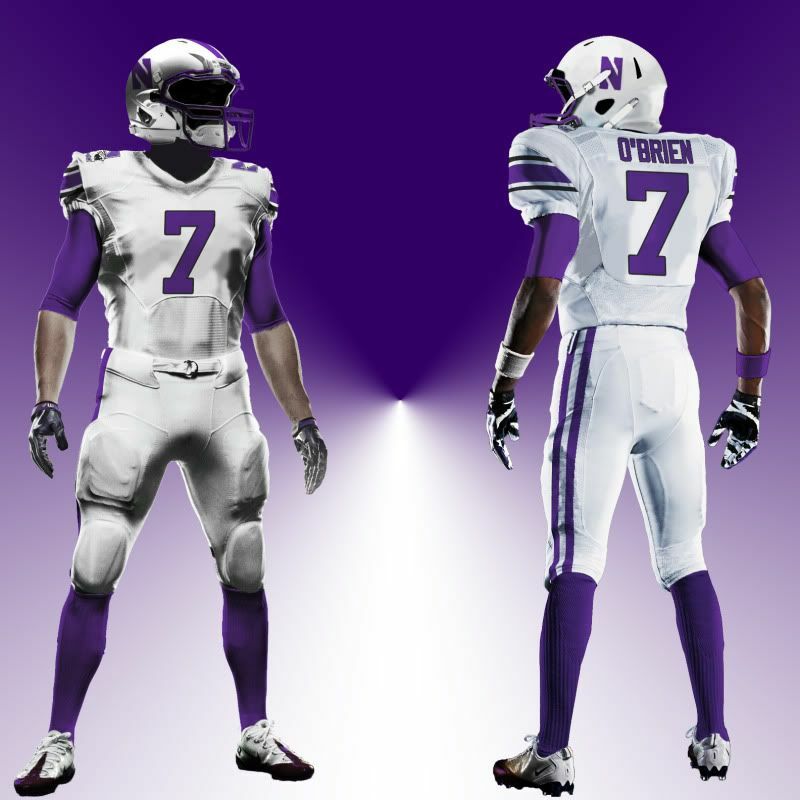 While it is a solid, winning look, I would still like to see some Purple/Purple/White next season. Behold the Vanderbilt game. The first home game in the uniforms and Coach Fitz has to go and slap a flag themed logo on the helmets because it's early-middle September. Listen, I get that you have a relationship with some military members and you go do that training session in Wisconsin every year, but September 11th was not a military attack and probably barely directly affected anyone on this particular football team. What you do to honor servicemen and women at halftime and during games is commendable, this silly decal? It feels like a gimmick - something well beneath what people who serve deserve. 1. The first all black uniform in school history. 2. The first black helmet in school history. 3. The first helmet to feature a logo different from the 'N' since 1980(The Adidas one-off helmet had no logo, only numbers). I believe Northwestern played a high school this game. What's that? Illinois? Sheesh, I hope they fired that guy who got two sideline interference penalties. NO‽ See you in Champaign, Illini! But in all seriousness, this look would be GREAT, with the normal helmet. It would be a nod to the success of the mid '90s and early aughts and would still be part of this great modern Under Armour set. Also, please don't ever wear that helmet again, the logo just doesn't work like that and the silver and black makes it nearly invisible. The first bowl win since 1949 and the Wildcats wore a purple jersey with a strongly featured Northwestern Stripe, what could be wrong? A: The helmet. Now, let's be clear, I don't even mind that they wore the matte black helmet again - Black/Purple/Black, in and of itself, is not a bad look - but the logo was damn near invisible again and while I'm glad it was the iconic 'N', Had it been purple or white, I would've been in love. 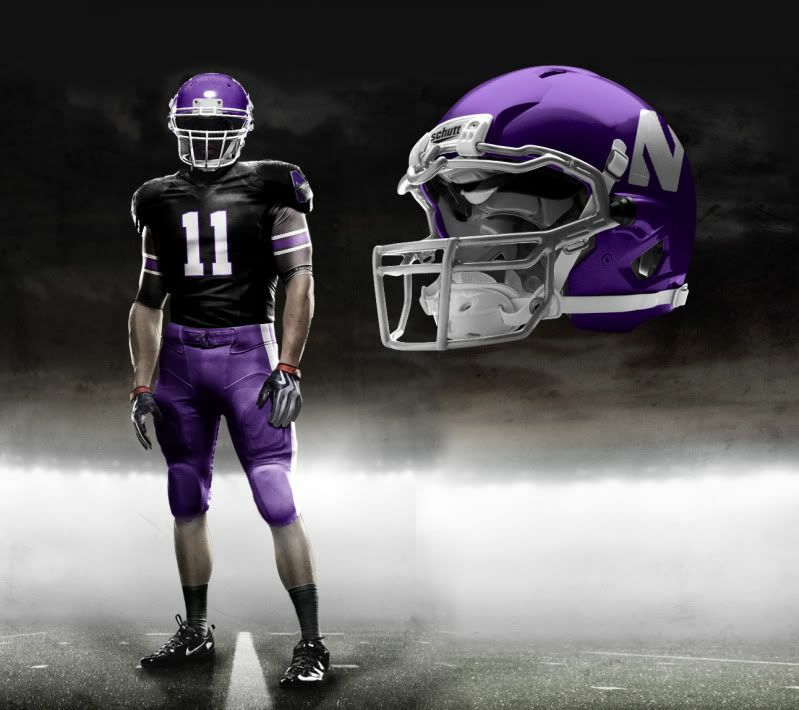 This uniform is a nice change from the norm, but I like the idea of Purple/Black/Purple even more. The only uniform set with a worse points against average than points for, there is just one, simple, undeniable take away: Don't wear the white pants with the white jersey anymore. 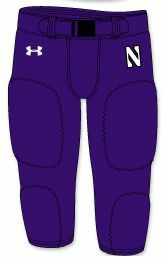 That should be an easy concept, as Northwestern has - in the past - rocked both purple (think Darnell Autry) and black (think Zak Kustok) pants on the road to great success. The clear road uniform leader in the clubhouse. 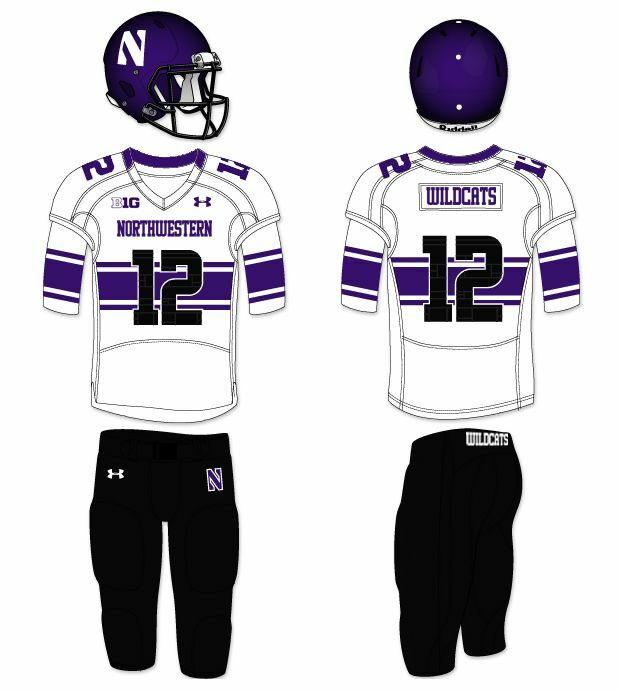 I still hope to see purple pants on the road next season, but the black is a nice look with ties to the successful recent past. 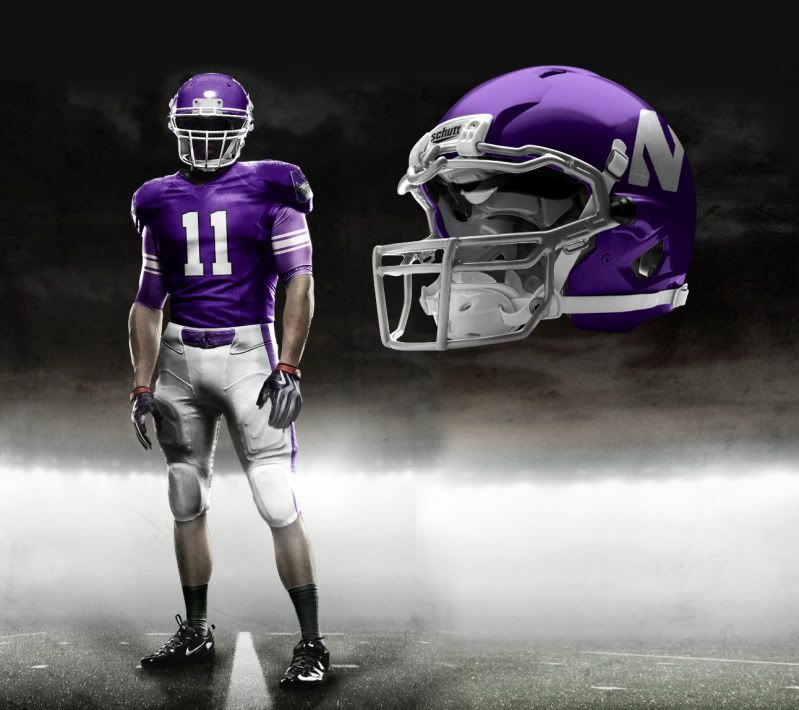 The classic, standard Northwestern helmet had a helluva season. Not the most successful on offense or defense, the helmet had a somewhat unremarkable season. However, it's still the best lid the 'Cats wear, in my book. As said above, this was the Vanderbilt game. It's just not a good logo. Please dump it. In it's two appearances, the outcomes could not have been different: A blown lead against Nebraska and blowout against Illinois. The 'Cats were going to beat Illinois if they came out of the locker room naked, so really this helmet should be judged by its performance against the Huskers. Not good. Retire it. Both undefeated and the best defensive jersey. The purple jersey is both successful and one of the best new jerseys of 2012. Highlights include the bowl win, two victories over SEC teams and a points for to points allowed ratio of almost two to one. 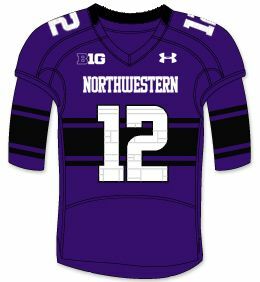 Tough to beat out the Purple as Northwestern's best new jersey. While the most offensively explosive jersey, the black jersey was a mixed bag this season. Just like the Black Cat helmet, this jersey was there for a season high and a season low. Now, if the 'Cats were to pair this jersey with the purple helmet and pants, I could almost root for that to be the dominant home set, but alas, we'll have to wait until next season to see if my dream comes true. 1. The black pants saved this jersey's record. 2. If at all possible, don't play road games. Obviously, the points for to points against ratio is bad, but it's tough to win on the road. 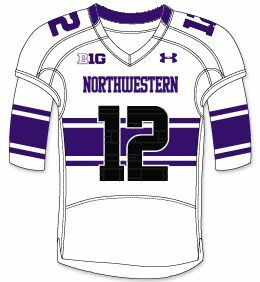 This jersey should be commended for it's boldness, unlike the other jerseys, the Northwestern Stripe is so bold it cannot be ignored. It's a great look and I can't wait to see it with the purple pants. Worn nine time, these pants have an amazing record. Their only loss is the Nebraska game, but we can blame that on the Black Cat helmet. This amazing record should be taken note when it comes to road games. I love the black pants, but they still aren't my favorite. This is the Illinois game. The only time they were worn, the 'Cats played their most dominant game. Take note Fitz, the purple nickers need to be worn more often. These are the best pants of the bunch. Well, that's 2012-13 in a uniform. It was an amazing season in which things I hadn't ever seen from a Northwestern team seemed to happen every week - even before the season started - and that culminated in a dream come true: A Bowl Victory. I've been uni tracking for a while now. 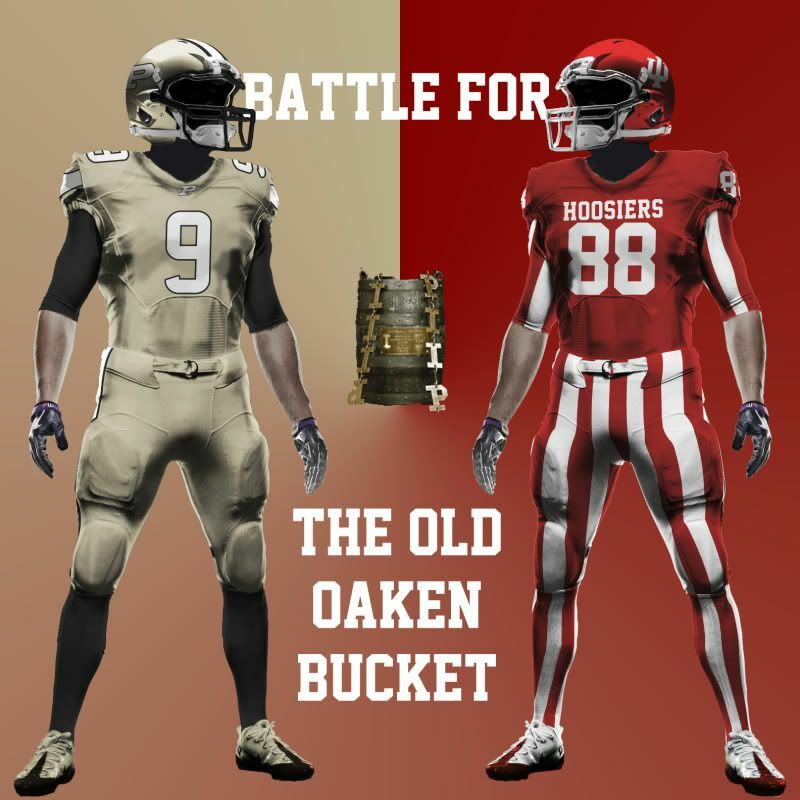 Last year, in the wake of the release of Indiana's white helmets, I began the Hoosier Tracker. Soon thereafter, I began my collaboration over at the Basketball Uniform Database. This year I have decided to track Northwestern's new duds and have been given the honor and task of being the third iteration of the Duck Tracker. The Duck Tracker brings new challenges with the position. Obviously Oregon's many uniform combinations and frequent one-off uniforms present challenges in getting the most up to date documentation up as quickly as possible. With the Hoosier Tracker, once I had set it up, it basically took me five minutes to make the changes and upload the new picture. On many weeks, I had the Hoosier Tracker updated by the opening kickoff (just in time for the irish coffee...). This is my goal for the Ducks this year, but my muti-tracking means this might not be the case every week. But the previous three season of Duck Tracking have been excellent and popular - very popular - and the need to keep up with the precedents they set is a challenge I hope to live up to. And this is the challenge of breaking into uni tracking: The seemingly daunting task of tracking. This is why, today, I call on anyone with some free time and the will and the tenacity to pick a college football team and track them. It's for the greater uni-nerd good. The task will not be as hard as it may seem, as almost anyone can do it. All you need is a .blogspot.com address and a way of tracking your team. The great thing about tracking is that the way in which you can track a team can vary from person to person, team to team and it can also reflect something about the tracker. For my Hoosiers, last season I used a 3D template that I had created with a background that changed based on the location of every game. This personified what I've been known for over at Uni Watch (the 3D templates) while actually putting them to good use. But I wouldn't expect Rick Pearson to track like that. Knowing how Ricko used to track, I wouldn't want him to track like me. And that's the point. Some people will hand draw, some might just use game photos and some might use templates like I plan on using this year - in some fashion - for the three schools I'll be tracking (If you are a person who may want to use a 2D or 3D template of mine, you can find and download them here). For anyone willing to take up my challenge, I will add a link to your website to all of my tracker sites and together we can start a revolution. Hell, if you are really going to join me, I am even willing to make you a header logo that fits the theme of the three headers I will be using this year. Rather than taking on a whole league or a whole history, let's start small, together, and we might be able to accomplish something collectively great. Let me introduce myself. My name is Tim O'Brien and I am graduate of Indiana, class of 2010. I have long been a Big Ten football fan and a diehard Hoosier fan since first stepping foot on campus. In my relatively short time supporting IU football, I have been witness to the hope that Terry Hoeppner brought, the moving 2007 season, the struggles under Bill Lynch and the disappointing 2011 campaign. While there may be a lot of bad history over the past few years and - well - decades, hope springs eternal. I believe in IU football and I trust we have the program headed in the right direction on the field. However, I do believe that Hoosier football is headed backwards in one sense: Aesthetically. When Coach Wilson came to IU, the Hoosiers came off one of their visually ugliest seasons. 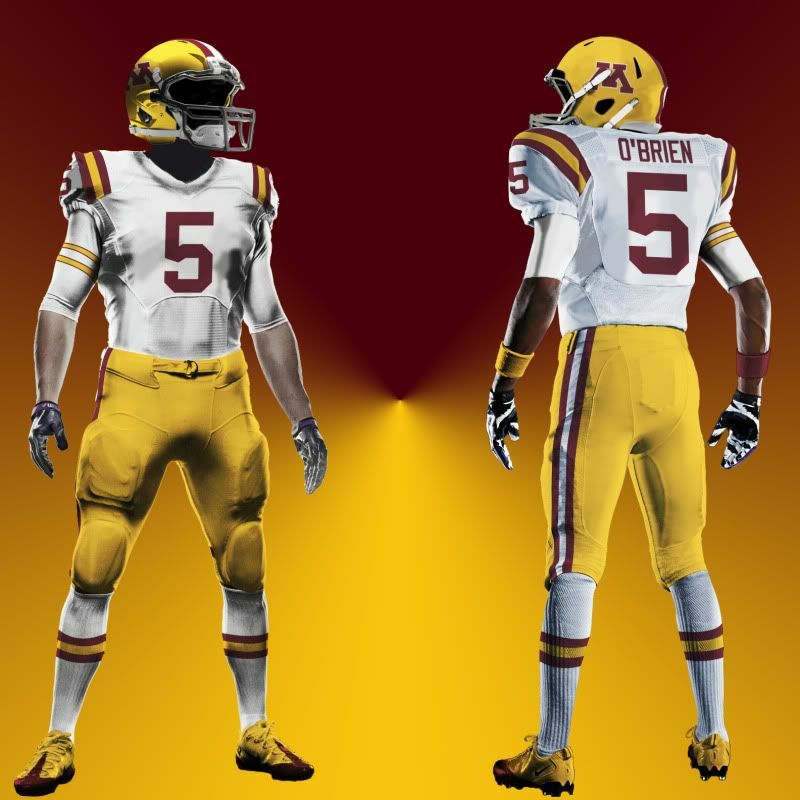 By allowing Adidas, and not tradition and a demand for excellence, to dictate our football uniforms, we ended up wearing these hideous, ink-blotted uniforms. Now, they may not have been as bad as when black was a part of the uniform when Randle El was in Bloomington (black is for boiler makers) but the lack of attention to details that plagued IU football on and off the field was visually symbolized by these bad uniforms. Last season, Coach Wilson - and the football staff - came in, cleaned house and cleaned up the Hoosiers' uniforms. And while they were not bad in any specific sense, these uniforms lacked individuality: Coach Wilson brought not only a wealth of football knowledge from Oklahoma, but their uniforms too. Let's take a closer look at the two uniforms. Both have red helmets with white facemasks and interlocking '_U' logos. 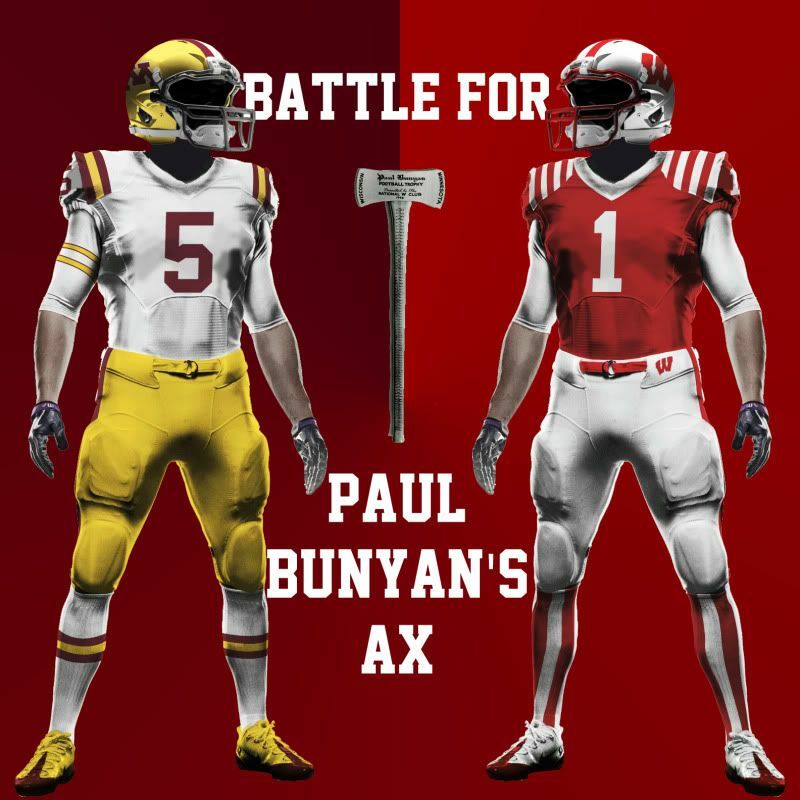 Both have solid red or solid white jerseys that have team nicknames (that confuse people not from that state...) written in block lettering and both wear white pants with red double stripes for every game. The only defining IU characteristic was a white helmet that, as you can see from this uniform analysis I did, brought us nothing but five losses and an average of 43.4 points against per game. 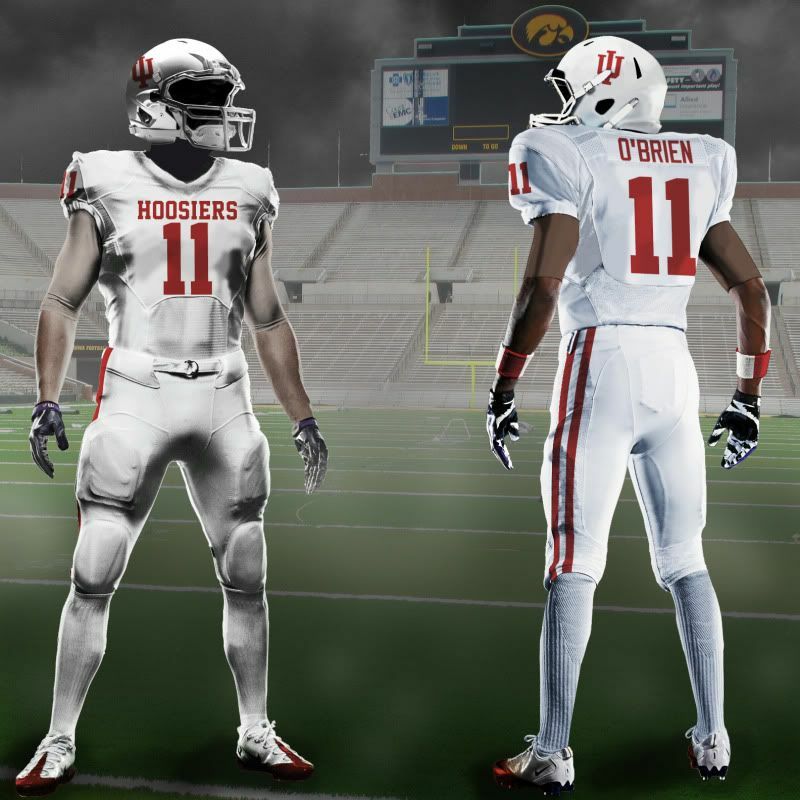 Not good (plus, IU has no recent history in white helmets, just do away with them). Now, while I understand why this new uniform set was created (1. To visually define a new era. 2. 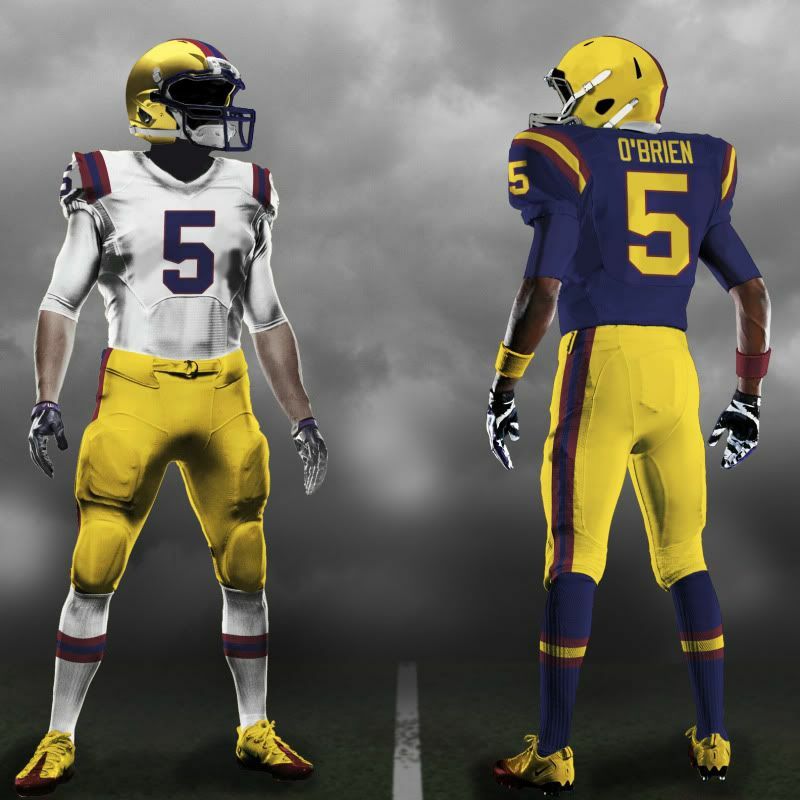 To get rid of those hideous previous uniforms. 3. To remind people of Oklahoma visually, and therefore co-opt their success and tradition. 4. The white helmet let the players have fun mixing and matching. ), you were not the first person to do that with Indiana, Terry Hoeppner did it, too. But not being original shouldn't be the only deterrence. Dressing up like another winning football program to inspire greatness and pride in one's own team is an old - and I would argue, incorrect - way of thinking. Just because you have the winged helmet design doesn't make you Michigan and just because you have a white helmet, you wont all of the sudden play like The U in the '80s. "All I'm saying, mon, is if we walk Jamaican, talk Jamaican and is Jamaican, then we sure as hell better bobsled Jamaican." What I propose to you is that last year's Oklahoma copycat uniforms were our Swiss team and the double stripe is IU's Jamaica. What do I mean by, "the double stripe?" Simple. 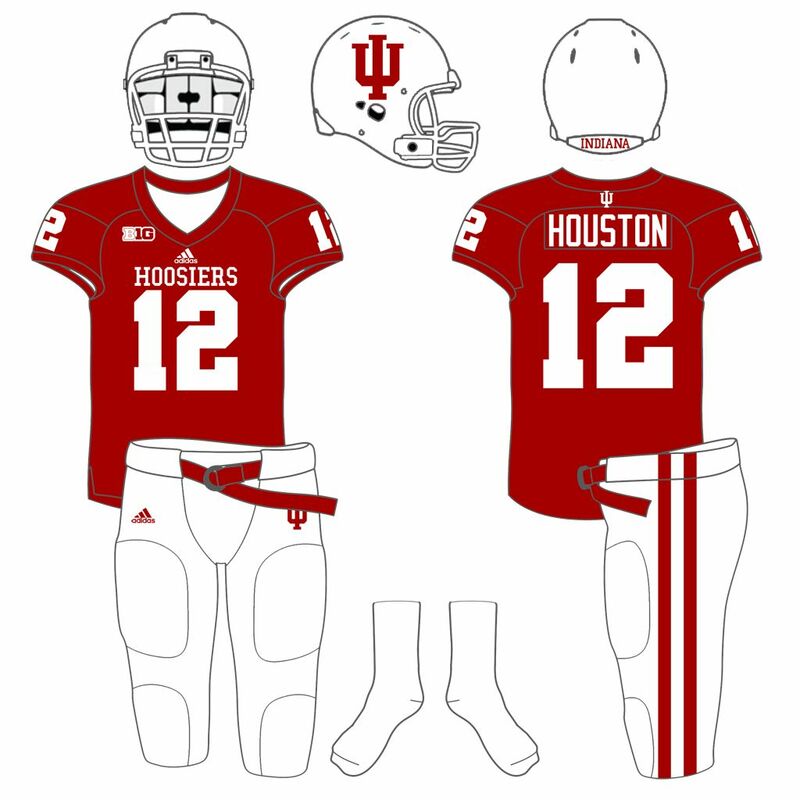 I believe it is uniquely Indiana when the helmet, jersey and pants all feature double stripes (white then a space and then white on red elements, the reverse on white elements). 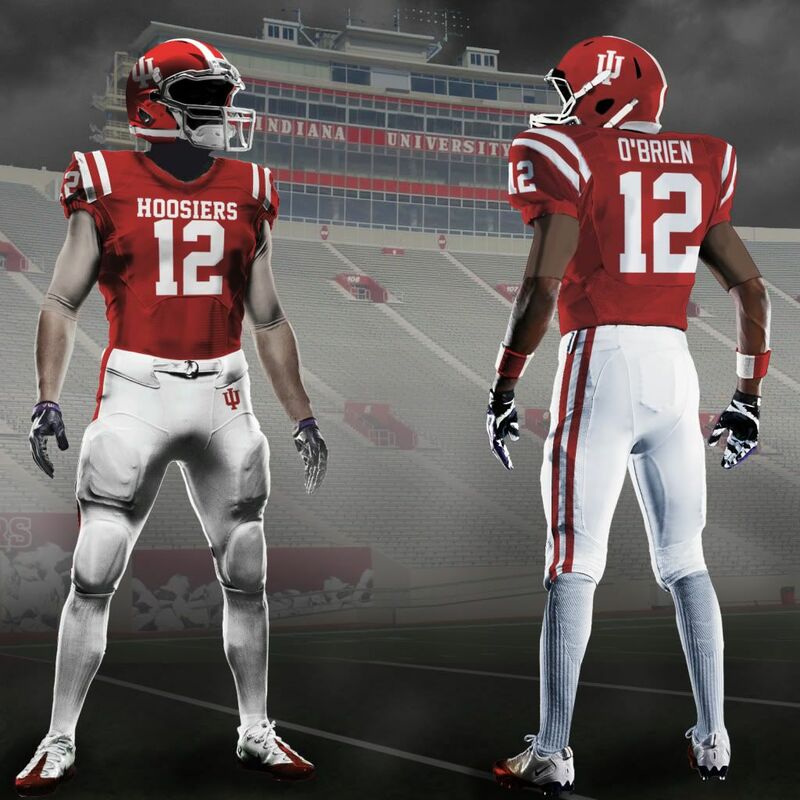 It is a simple, elegant uniform that is both modern and classic, just like the interlocking IU. The double stripe echoes the proud traditions of the basketball program but still states a unique take on the classic identity. 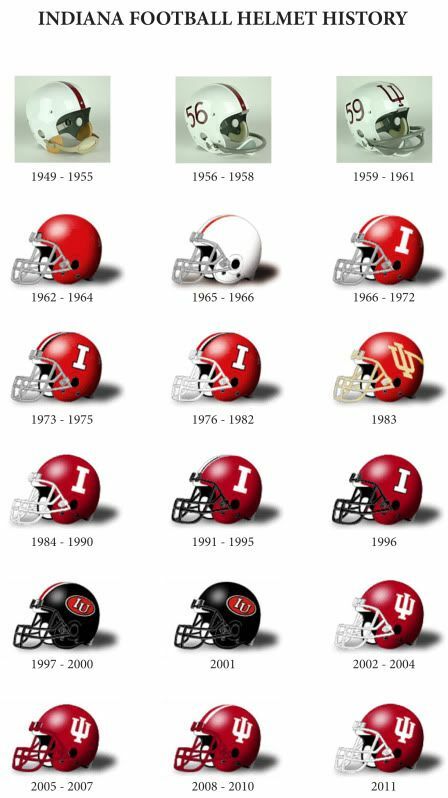 No other team in major college football has a white double stripe on a colored helmet, and yet Indiana has it in its history and tradition. 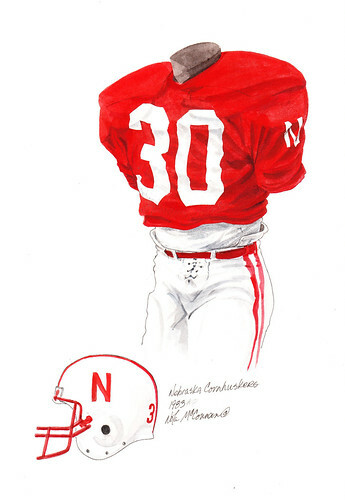 With this red helmet, you can the extrapolate the uniform from there: White double stripes on the red jersey's shoulders, red double stripes on the white's shoulders; the iconic block 'Hoosiers' remains; a red double stripe on the home white pants; and white stripes on the road red pants. 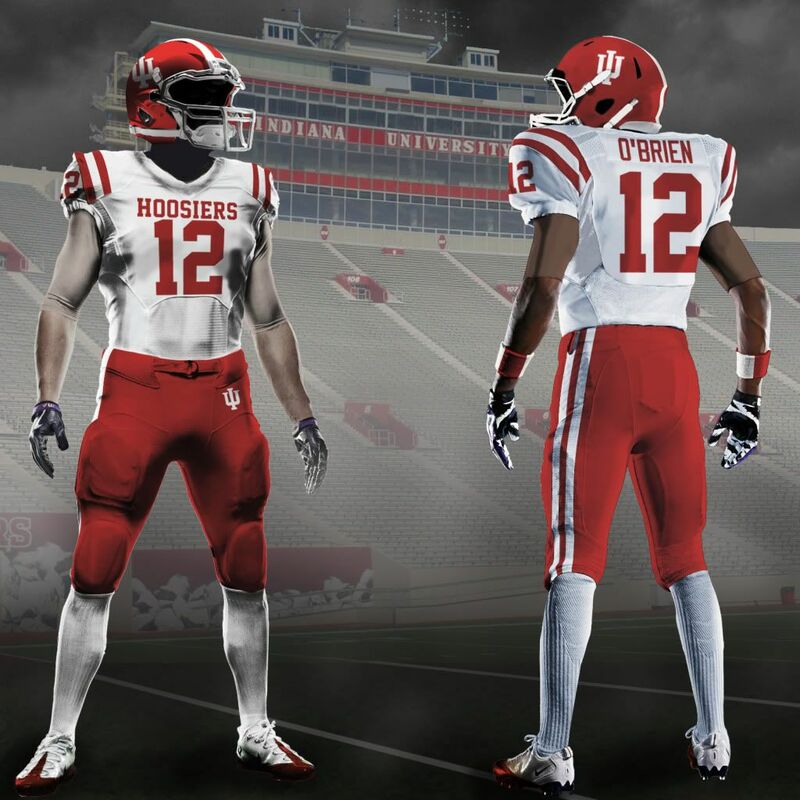 The red road pants are a key that will help define IU's unique image. I know you might be thinking that all of this is much ado about nothing, or that it's just outright nonsense, but people at the University of Oregon would beg to differ. Whether or not you think what Oregon (read: Nike) is doing visually with their football uniforms is irrelevant. What is clear is that both proponents and opponents of their aesthetic philosophy agree is that their unique branding and their attention to aesthetic details has brought them from obscurity to national prominence. The fact that they wear 12 different uniform combinations a season does not make them good at football, but by flashing these shiny objects in front of the eyes of 17 year olds while recruiting and then allowing them to wear these duds as student athletes has gotten them recruits that otherwise would've gone elsewhere. Some of their recruits have even acknowledged this. 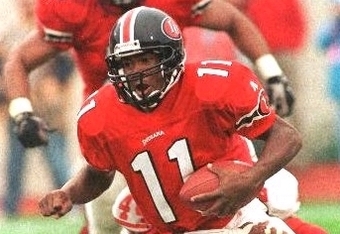 I could go on, but those teams (all of which played in bowl games this past season) all have played in unique uniforms and/or have played in 'one off' unis, like the Maryland flag uniforms - which were hideous but brought national attention to a program that is otherwise unimpressive. But unlike Maryland (Under Armour) and Oregon (Nike), IU doesn't have to go the rout of just giving their uniform supplier (in our case, Adidas) free reign, we can go a more classical route, like the one Michigan took this year or what Ohio State has been doing for the past few seasons: Keep a traditional, beautiful uniform as the normal set and sprinkle in some throwbacks, fauxbacks and punchy new designs. And one doesn't even have to go far from Memorial Stadium to find ideas, you can just look across the parking lot to Assembly Hall. By taking some of the iconic Hoosier imagery and tradition imbedded in IU basketball, Indiana can adapt and add it to football. Namely, the candy striped pants. How iconic are the pants? Google "Candy Stripe" and the first result is to Wikipedia which has a definition for it as, " Candy stripe, the warm-up style for the Indiana Hoosiers mens basketball team." That's iconography you can believe in. Now you may think those are a bit ostentatious, but Memorial Stadium already features the candy stripes, fans already wear the pants to games and, frankly, people seem to like my concepts with the candy stripes even if they admit that they're not all that practical. What they are is 'fun', something IU football is rarely described as. And while even I, the guy who came up with this idea, think that these shouldn't be worn every game, it'd be fun to see them once and a while (maybe even around the time of Hoosier Hysteria...?). Even if this idea is a real nonstarter, throwbacks are always fan favorites. 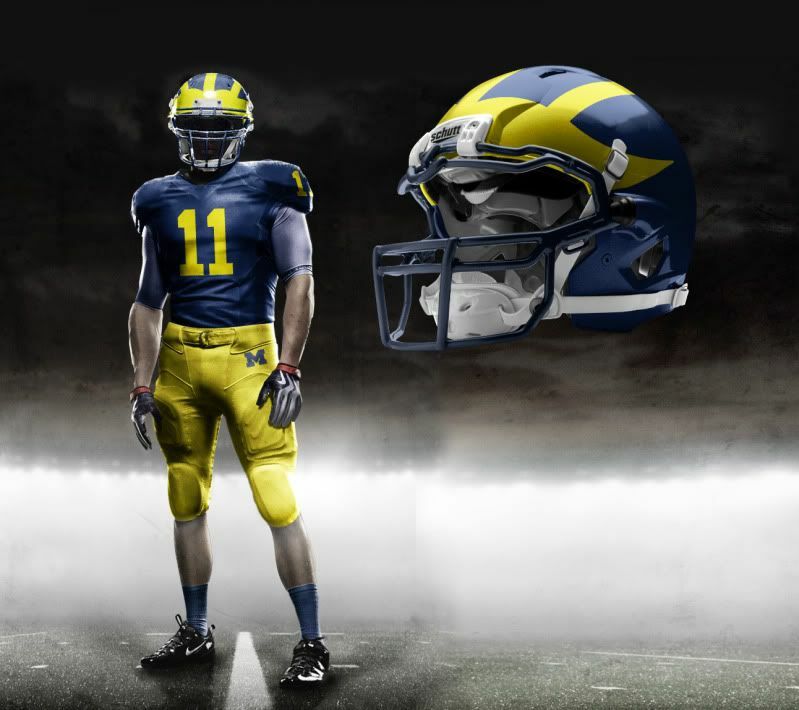 Michigan rolled out a few throwbacks and fauxbacks this past season to much acclaim. Student athletes got cool new uniforms to wear, merchandise stores got new jerseys to sell and alumni got to wistfully remember their days on campus. The Hoosiers could go back to an Anthony Thompson "Block I" throwback or go even further back to a design from the 1933 season, home or road or anything in between (heck, the Hoosiers wore powder blue in the early '50s). Anything is possible and most anything would be better than what we have now. What I want most out of my Hoosiers is winning and respectability. I don't need national dominance, I don't need crazy uniform combinations every week and I definitely don't need to watch what feels like the Oklahoma freshman squad. I just want to be proud of how my team - my University - looks when they take the field, both in play and in dress. When I turn on the Hoosiers, just like in basketball, I want to see a team I can recognize as truly 'Hoosiers'. Because if we walk like Hoosiers, talk like Hoosiers and be Hoosiers, then we sure as hell better play football like Hoosiers. 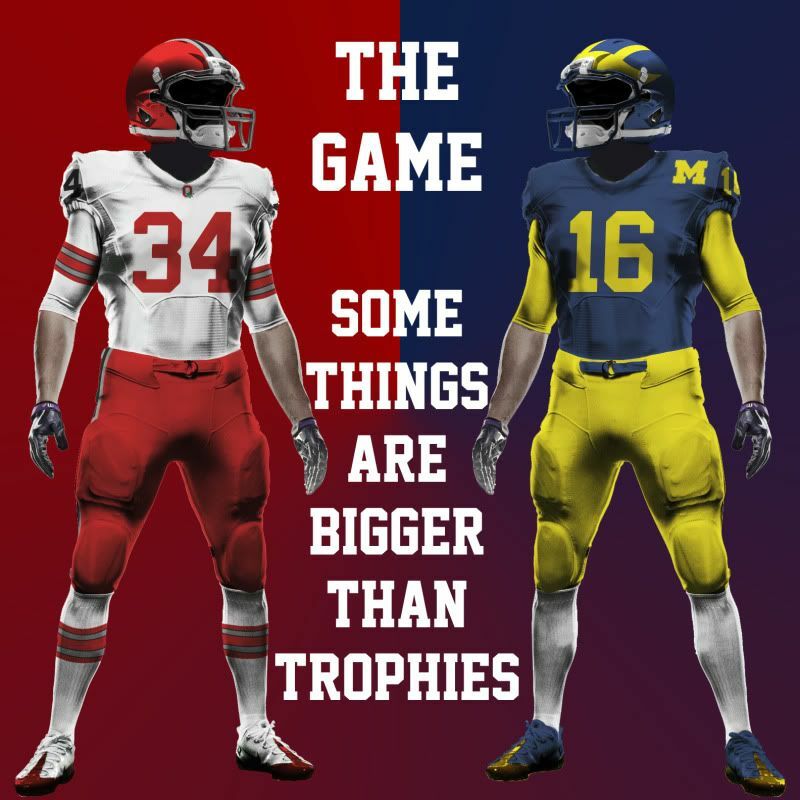 This weekend, BigTen conference football returns and so do BigTen rivalry games. 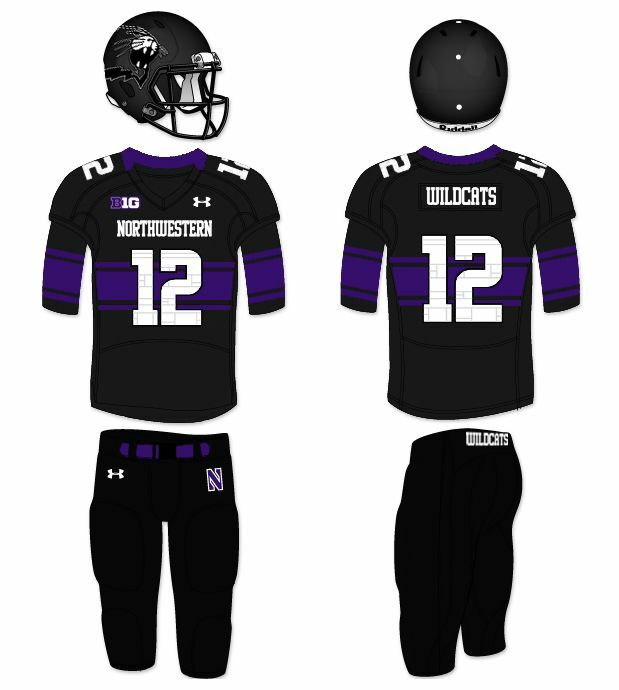 Earlier this month, I posted my concepts and tweaks for all 12 BigTen teams here and on the wonderful SportsLogos.net, showing what I thought the schools should wear every game. Some people over at SportsLogos noticed that many of my designs a fairly traditional and/or pretty close to what most BigTen teams currently wear. 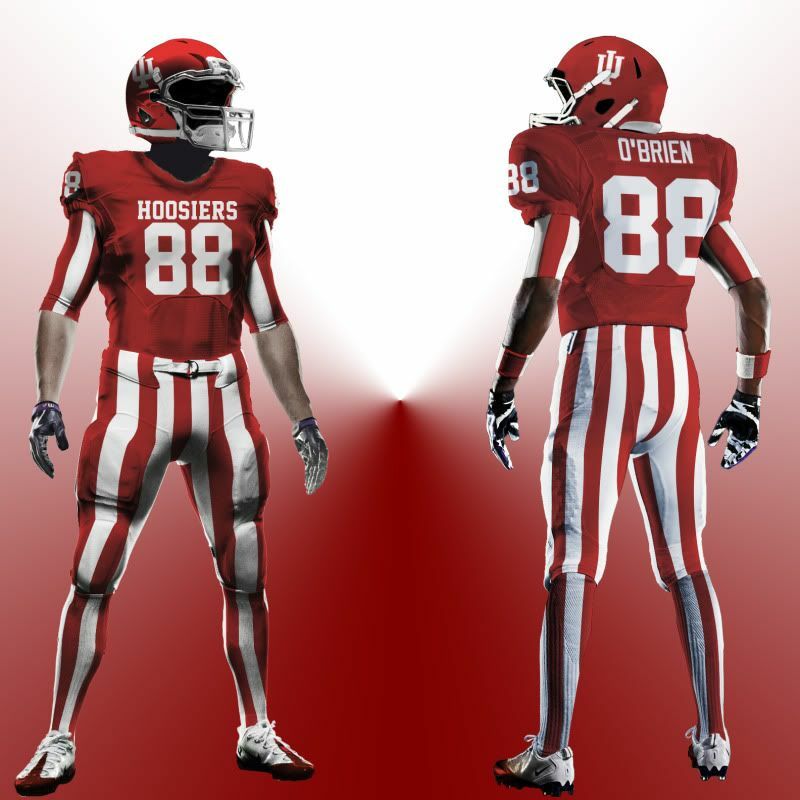 Indiana: I bring back my much beloved candy-striped pants but pair them with (a variation of) their actual 2011 jersey. The helmet matches their current lid and features the iconic interlocking 'IU'. Now, originally, my design showed a candy striped helmet and that the compression shirt sleeves and the socks not matching, but that was because each individual player could either wear vertical or horizontal stripes - so long as they wear all matching - allowing for fun customization while still being 'uniform'. However, I scrapped both those ideas and returned the standard helmet and unified all the stripes. 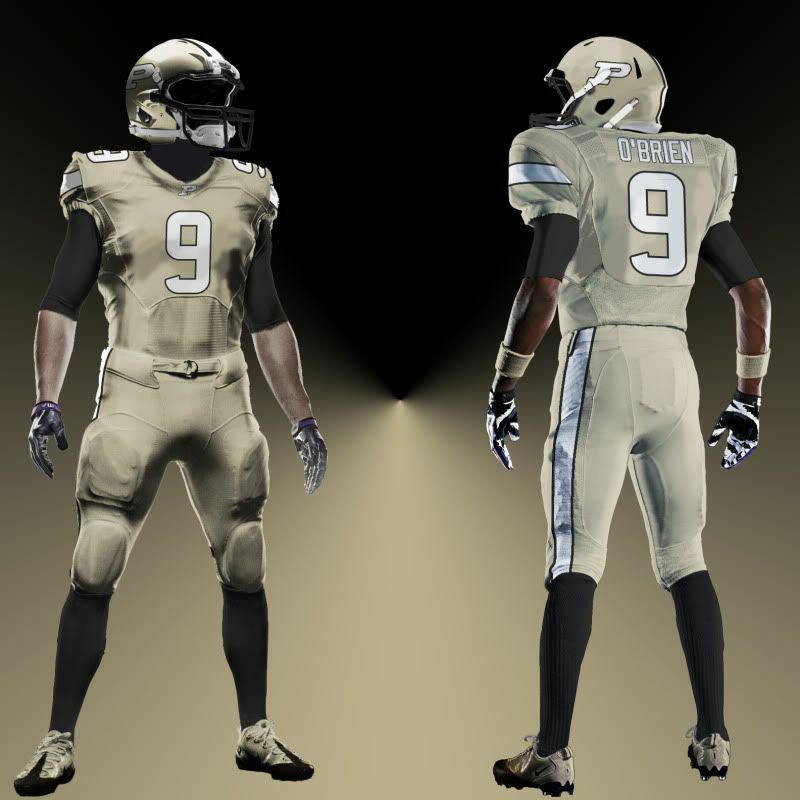 Purdue: As this years visitors, Purdue comes to The Rock wearing all old gold. The 'P' logos; helmet, shoulder and pants stripes; and numbers all sink up to match: Black trimming White. The numbers are a modern variation of classic varsity block. Finally, the compression shirt and socks are Boiler black. 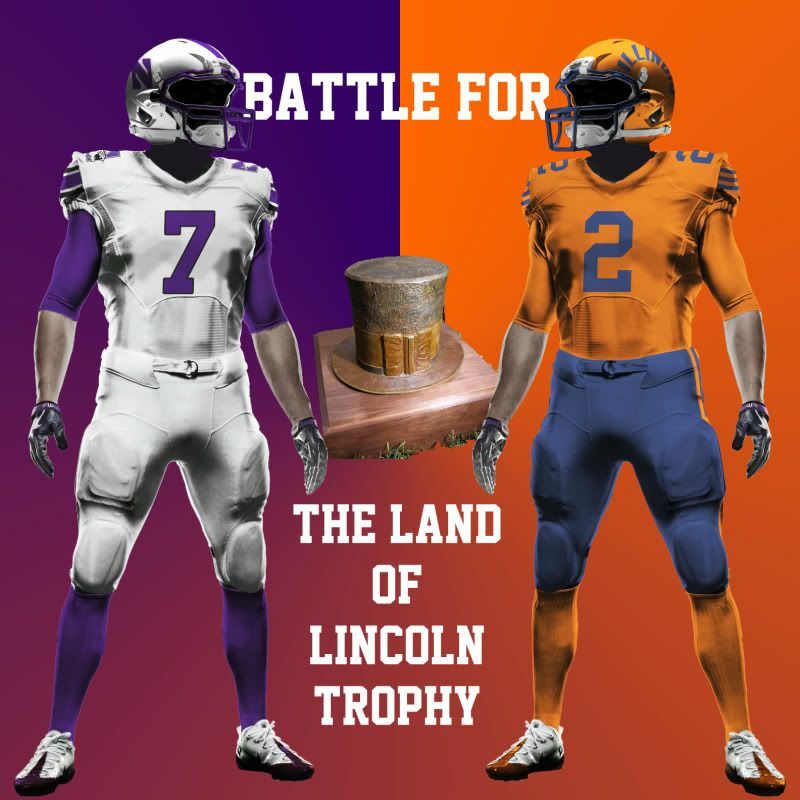 Illinois: The Illini host this year's Sweet Sioux Tomahawk game Land of Lincoln game, and they come onto (a) Memorial Stadium* wearing fauxbacks to a simpler time. Three simple stripes grace the shoulders and pants. A rounded version of the state name appears on the helmet (as opposed to "Illini" which has appeared on the lid in the past). Only blue and orange grace the uni (except the shoes), just like it was back in the day. Northwestern: The Wildcats are also donning a fauxback of sorts. 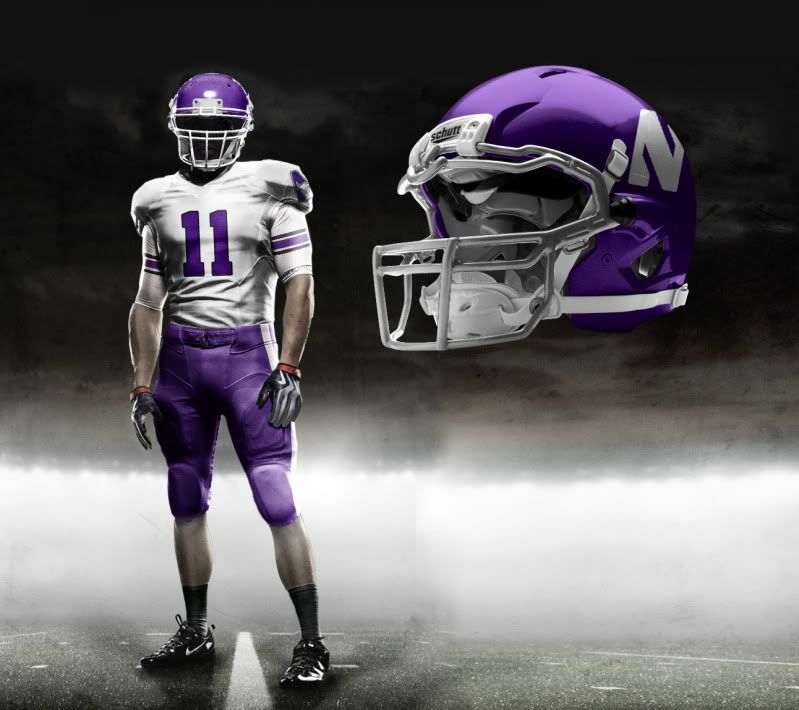 The white helmet is inspired by this helmet from NU history. 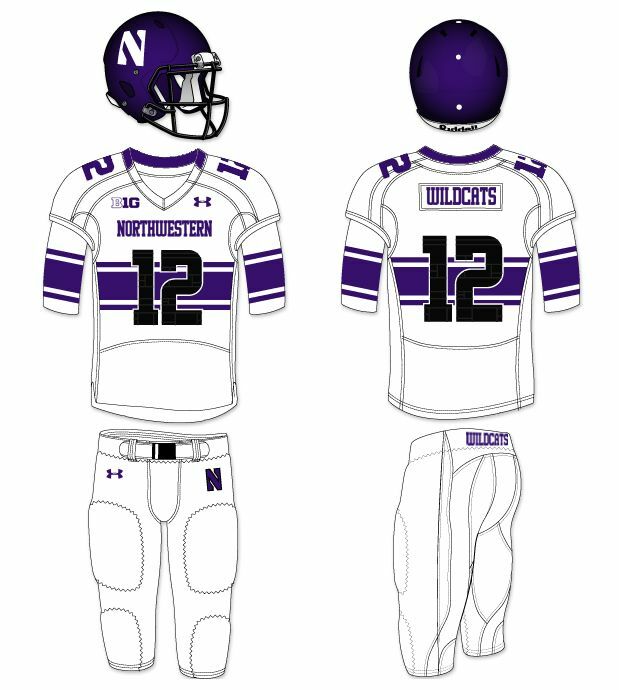 The jersey is basically their current road uni with the addition of the 'N-Cat' logo while the pants have a purple double stripe that give the 'Cats a sleek, clean look. 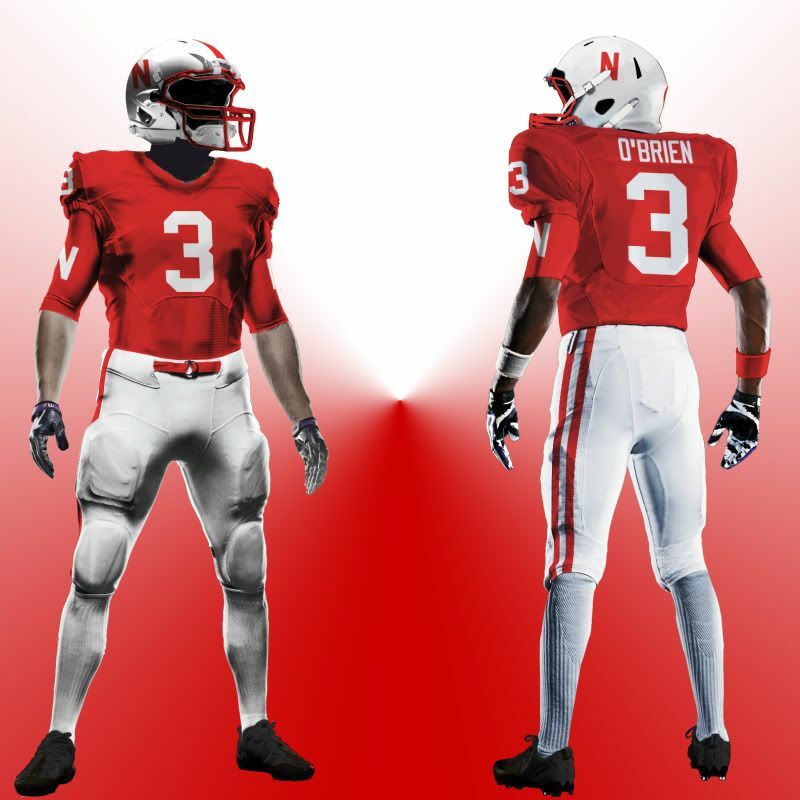 Nebraska: As the home team, Nebraska comes out in a uniform that honors many of their best teams from their long, storied history. While the helmet design is the same as the one's they've worn since 1970, the red facemask harkens back to 1982. The jersey focuses on both those eras as well. 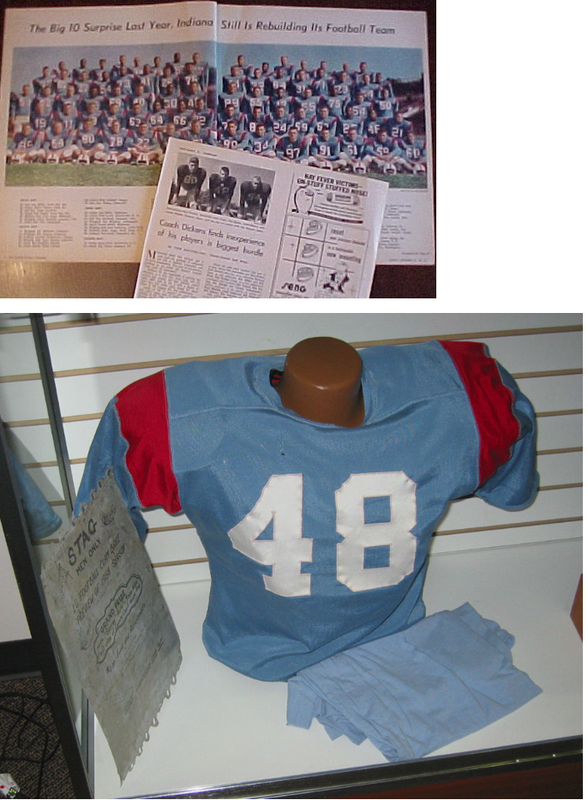 The shoulder numbers are from the 1970 unis while the sleeve 'N's are from the 1983 team. The pants are from both eras but the red belt screams 1983. The black shoes and white socks go through many generations of Huskers. 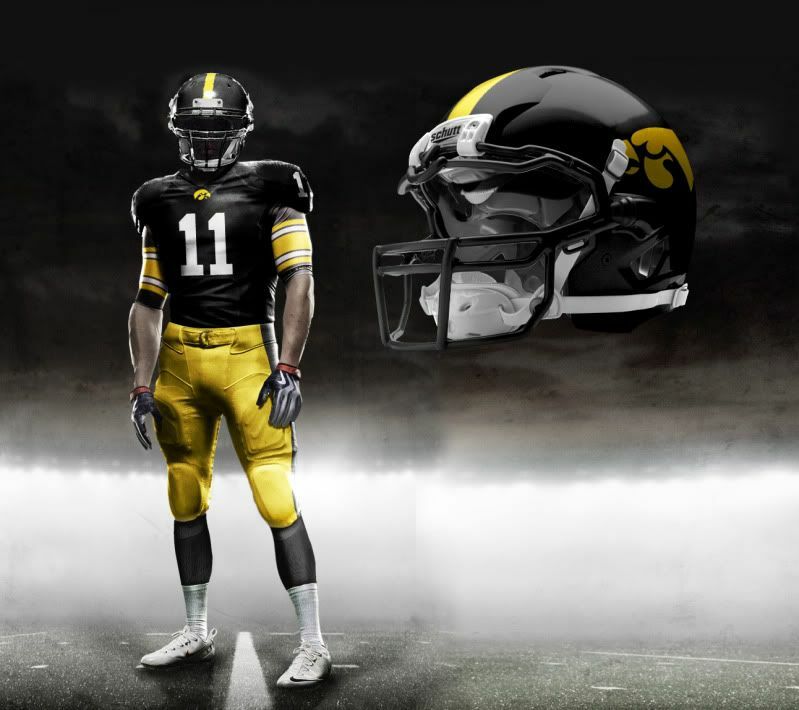 Iowa: The Hawkeyes come into (a) Memorial Stadium wearing fauxbacks to their 1958 National Championship team. 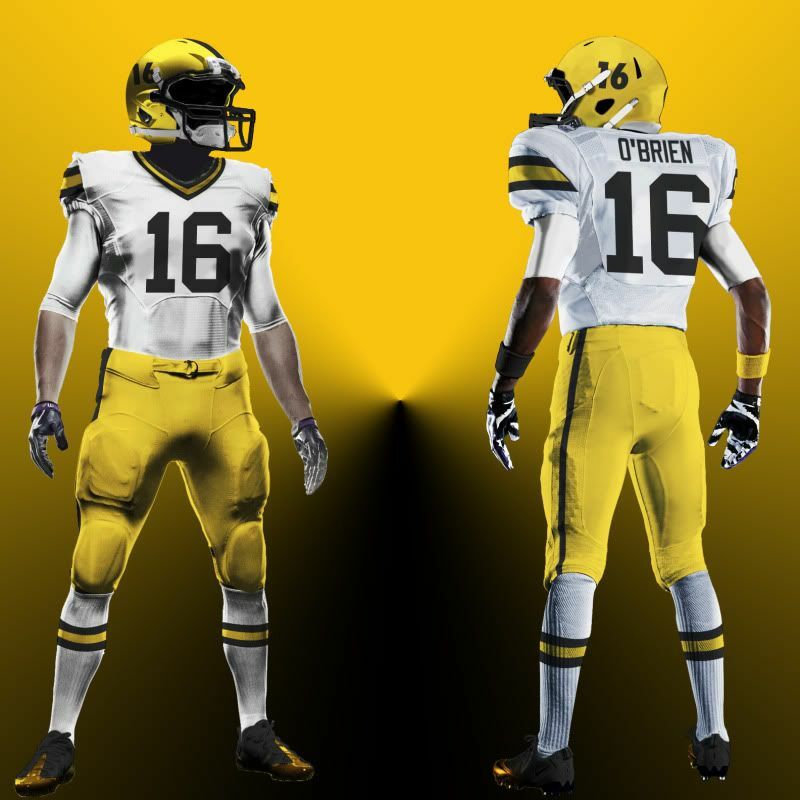 While Iowa has worn fauxbacks to this era before, they've never worn the road version of these before. That's a shame, because those were some beautious unis. The moving of the stripes from the sleeves to the shoulders is just for player continuity (no lost stripes due to lack of undershirt). Also, the facemask is unapologetically black. 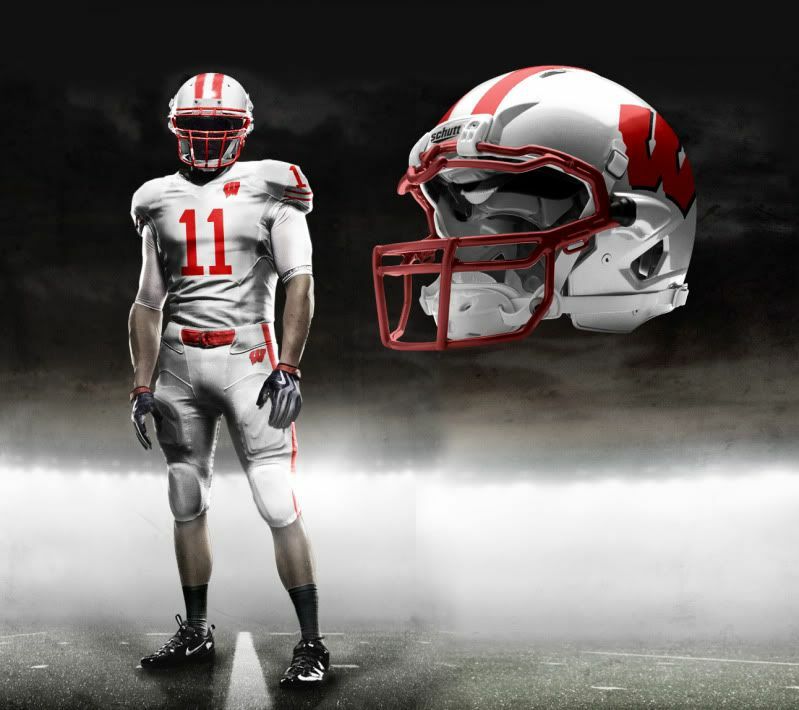 Wisconsin: The home team in 2011 comes out wearing something like nothing you've ever seen take the field at Camp Randall. The helmet is a variation of the current helmet that rids the flying W of it's unnecessary drop shaddow. This harkens back to most of Wisconsin's history, when the helmets were only white and red. The Jersey is simple yet completely original. The shoulders are adorned with stripes that will quickly remind any UW fan of Bucky Badger. While the pants are almost identical to their current set, the socks pick up on the Bucky Badger theme and run with it all the way to victory. 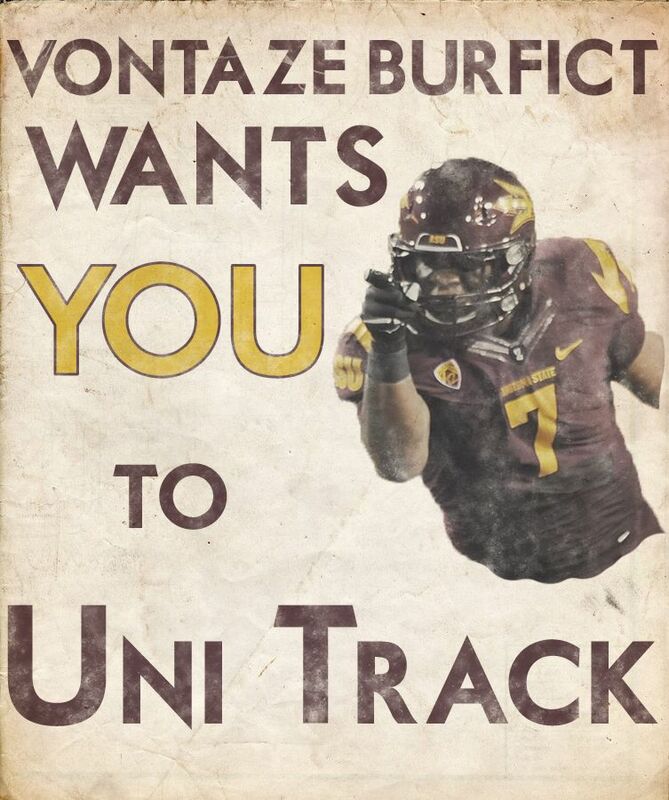 Minnesota: The Golden Gophers have a tough task winning in Camp Randall. This Fauxback set calls upon the predecessors of this Minnesota football squad to lead them back to the path of victory and BigTen supremacy. The undershirt features Goldy Gopher's double stripe (just like my other concepts) and gold become predominant to remind the team of their victorious and glorious past. 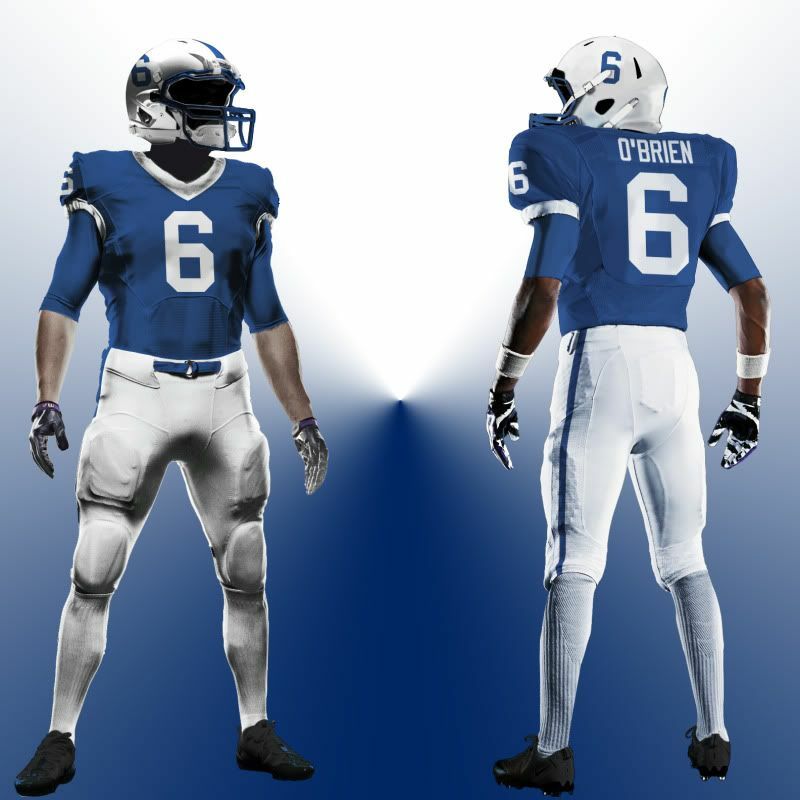 Penn State: The home team for this game will march into Happy Valley with a uniform that will be very recognizable to it's fans and opponents. While there are some design changes (many of them have a fauxback feel) the biggest difference may be the color on the uniform. The Blue on these unis are more royal blue than the current navy blue unis the Nittany Lions currently wear. This is a throwback to an earlier era. Combine that with helmet numbers, the return of white jersey accents and a singular, thin blue stripe on the pants and Penn State has a modern update of a classic uniform. 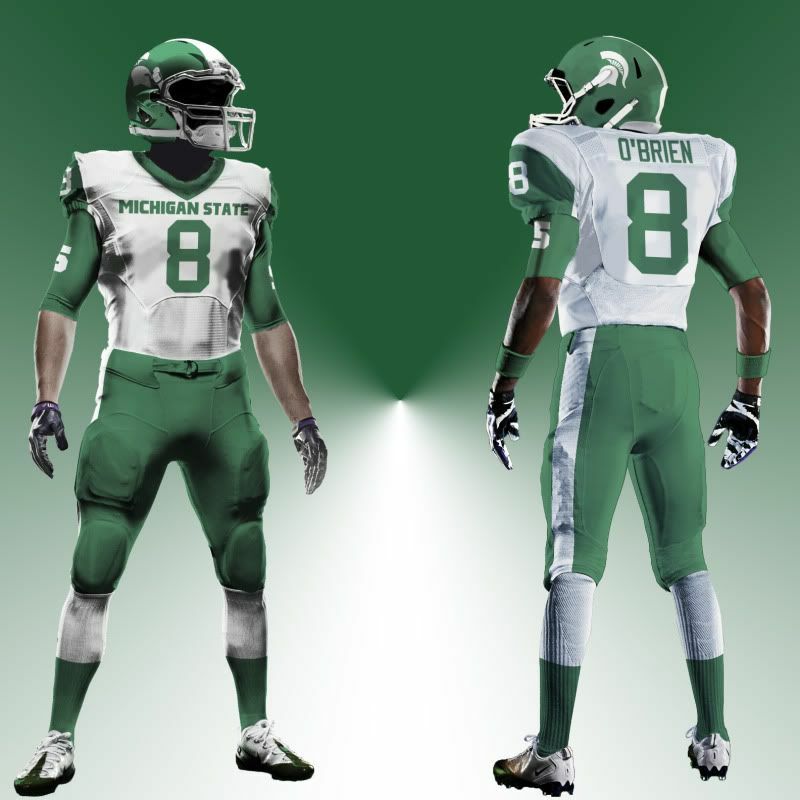 Michigan State: The Spartans recently unveiled a new Nike Pro Combat uniform for 2011. However, I disagree with Nike's use of Bronze and Black on MSU's uniforms, particularly since MSU is named after a group of people who are famous for wearing red. But Michigan State's colors are green and white and as such, those are the only colors I use on this uni. 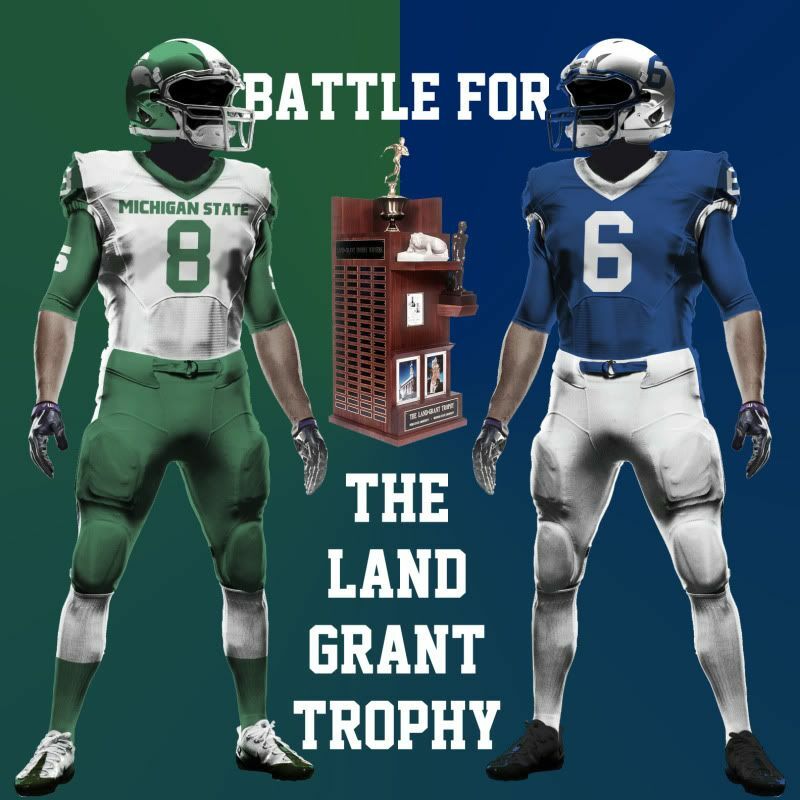 The shoulders of jersey pop thanks to a green field that adorns them which flows nicely into the optional green compression with an updated version of MSU's 'S' logo. While the jersey numbers revert to a more traditional font, the university mark is updated to match the 'S' logo font. Thick white stripes grace both the helmet, pants and socks and help unify this uniform. 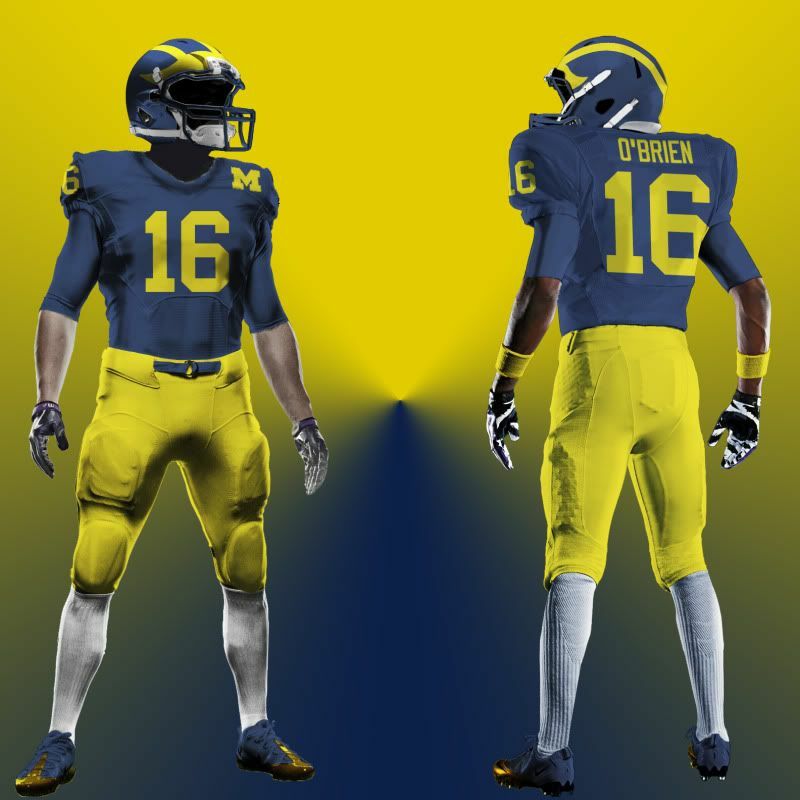 Michigan: As a BigTen alumnus, it's very hard for me to conceive Michigan wearing anything but their normal helmets, blue jerseys and maze pants at The Big House. I actually liked the fauxback they wore against Notre Dame, but I didn't want to re-tread the ground Adidas already walked. Instead, I made minor changes to the current home uni and left one of the best lids in all of sports untouched. The jersey gets an 'M' logo sewn onto the shoulder as sort of a 'pride-patch'. 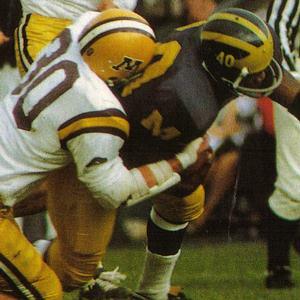 While a player's name and number are usually the only thing to grace a Wolverine uni, I wanted the 'M' to be on there to remind the players that the glory of the game should go to Michigan. While I added a blue belt to the pants, I removed the 'M' logo from them just to simplify the uni even more. The shoes and compression shirt are team colors but I'm not sure how much even I am digging the maze sleeves. Ohio State: The Buckeyes are Nike Pro Combat veterans at this point. With the theme of most of their NPC unis being 'fauxback' I continue this trend with a look back to the late '60s (just on the cusp of one of their greatest eras like hopefully this will be). While I could not find the exact specifics of the road uniform that matches this helmet, these jerseys, pants and socks probably approximate the jersey pretty well. 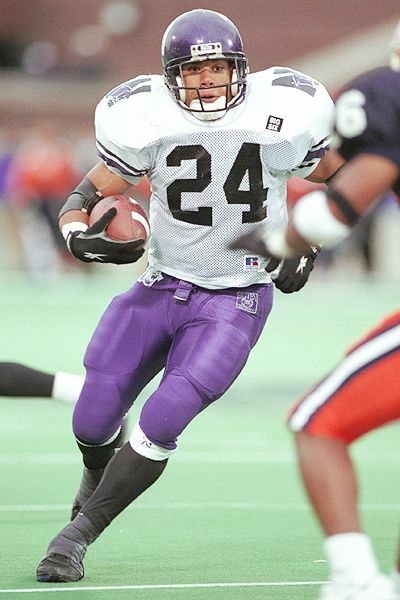 The differing color TV numbers are a signature part of OSU's look from this era and the Northwestern stripes that adorn the helmet, jersey, pants and socks unify this set as a world class Ohio State uniform. Well, that about wraps that up. You may have noticed the two new templates I was using. 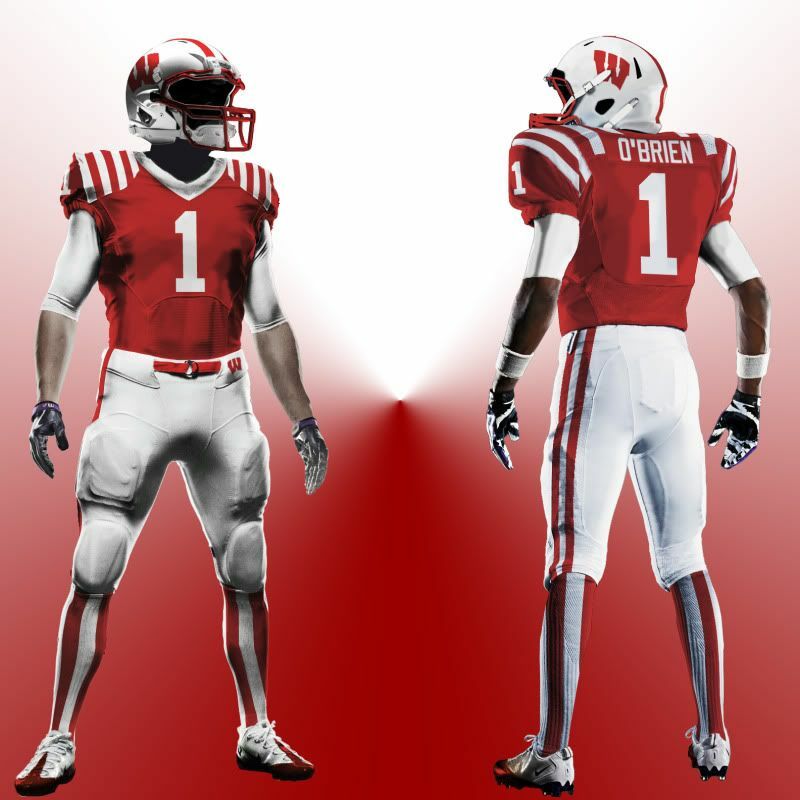 I'm proud to say that I created both of them and the one that features both the front and back of the uni has been improved even since I created these B1G concepts. I'm currently working on doing some ACC and SEC stuff in this new template which I'll bring to you as soon as I can. *With Nebraska now in the B1G, there are three Memorial Stadiums in the conference (U of I, IU and OU). The air is cooling while the spicy sweet smell of processed meat and charcoal wafts through the air - it must be fall BigTen football season. While my Wildcats and Hoosier are back on the gridiron, I'm back in the workshop fine-tuning the BigTen concepts I came up with a few months back. A pretty serious overhaul here. 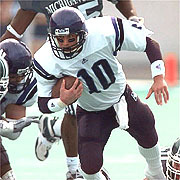 I go back to much more classical striping and a reduction of the Oregon-esque innumerable amount of uni combinations. Orange pants are my go-to road pants but I like the blue pants as a secondary option. 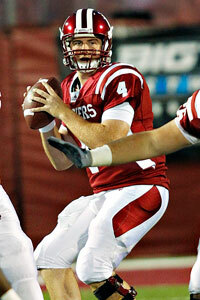 This was almost how the Hoosiers looked a few years back. Now, they're back to their best Oklahoma impression (including white pants on the road if the Ball State game is any sign. Sigh.) 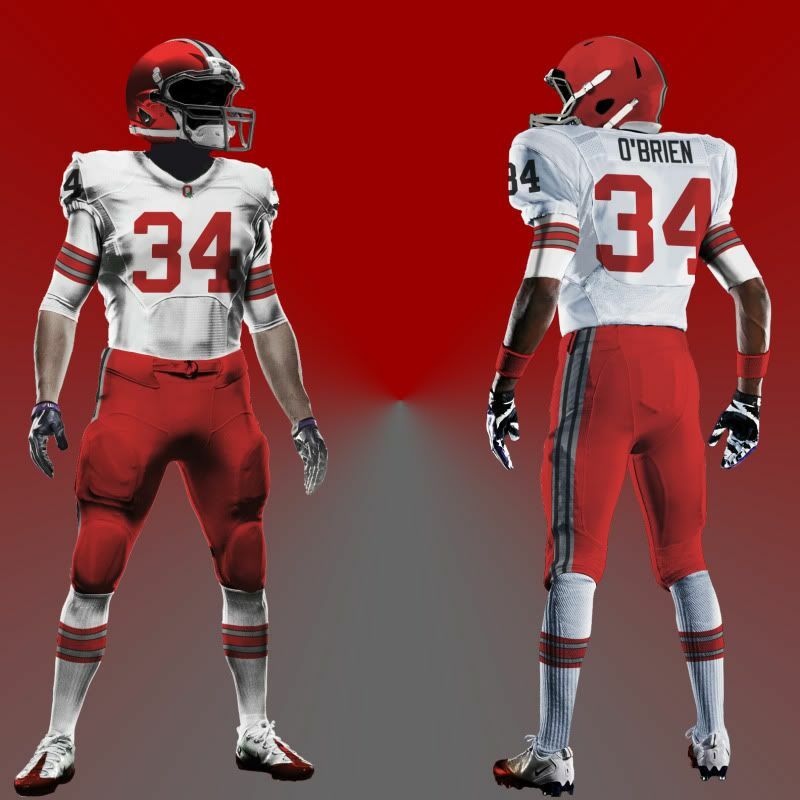 I go back to the double stripe helmet, add double stripes to the shoulders and keep the double stripe pants (white at home, red on the road). 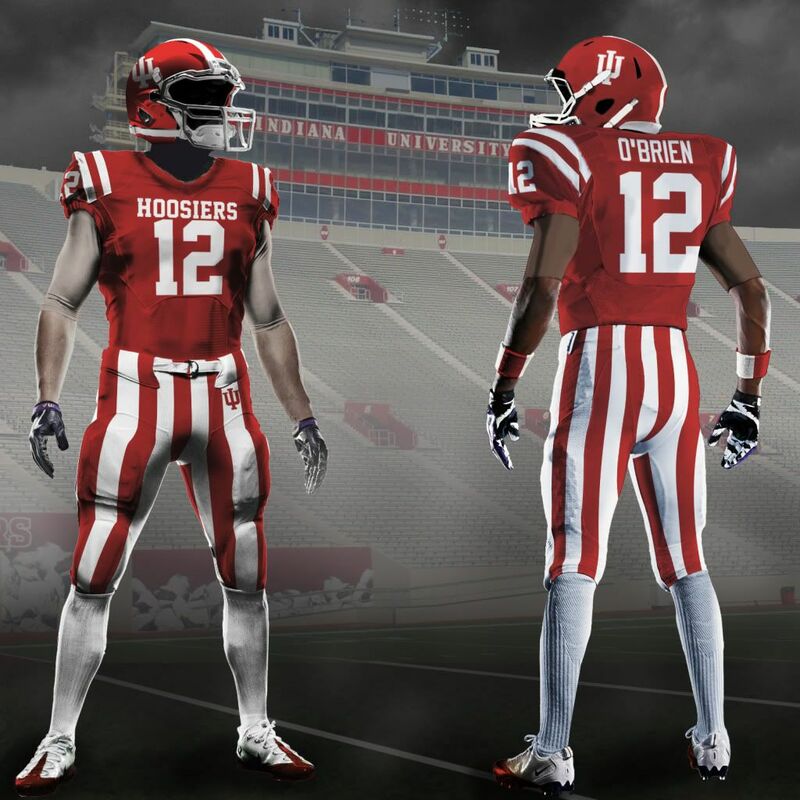 And I am one of the many Hoosiers who thinks that the Bucket game should feature special unis whenever possible, so I bring back my candy-striped pants for the occasion. Here is my first use of the stripes on the compression shirt. These Steeler inspired uniforms just look better when the stripes are in full bloom. 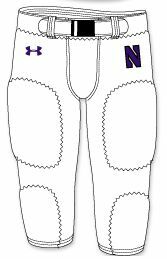 The Hawkeyes are also the first team with full length socks, but this is not a change from the norm for them, they've bean wearing socks like these for years. No real change for the Home (although I changed the socks to blue) but the Road eliminates and superfluous yellow piping. Michigan State's current uniform set has all the accoutrement of a hastily done 'modern' uniform: Stupid font, useless stripes and colors out of the color scheme. I go back to only green and white. I do like the idea of very wide stripes on the helmets and pants so I added those (although the Home Alt gets rid of those for a more traditional look). 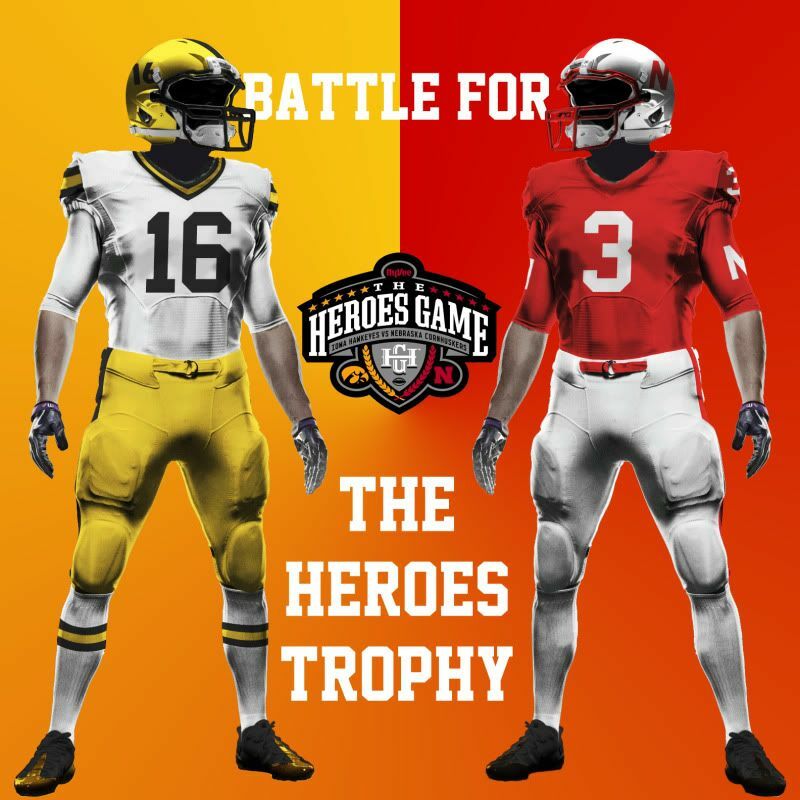 The Road Alts are fairly similar to the regular Road uni but the first is based off of this image and the other just uses green pants. Minnesota's current unis are terrible. I return the Golden Gophers to a much more traditional look and give them a unique asymmetrical sleeve stripe based on their mascot. Nebraska hardly changes, although their current sleeve stripes appear much larger than my version. And if you're gunna call the defense the Blackshirts, they might as well wear black (under)shirts. I ditch black pants, recolor the Northwestern sleeve stripes (which are now on the compression shirt) and return the logo to the shoulders. The pants are double striped and while I bring back the BFBS Home Alt, I would keep its use to a minimum. Basically all I did to the Buckeyes was keep the pants stripe more in line with the helmet and sleeve and replace the gray on the current road sleeve stripe with white. I return the trim the collar and sleeve, other than that, you can't improve on perfection. Purdue's new uni's stink and I go back to a more traditional look for the fools from West Lafayette. The numbers on the Home and Road Alt are gold, which I think is a really nice look. Almost no change here, the only thing I do with them is insist that they never wear red pants. At Home there's just too much red and with the Road, it makes them look even more like Nebraska (something they don't need any help doing). Those are my new BigTen concepts. I know most are pretty traditional but hopefully people will like them. Copyright © 2010-12, Tim E. O'Brien. All rights reserved.